Under the America Invents Act, the United States Patent and Trademark Office (USPTO) was given broad new powers to “correct” past mistakes in issuing patents through the power given to the PTAB, the Patent Trials and Appeals Board. The PTAB is an administrative law that decides issues of patentability, formed on September 16, 2012 under the America Invents Act. Their impact on patents, innovation, and the US economy has far exceeded anything contemplated when Congress debated this provision. They have become the “go to” route almost anytime significant patent litigation is underway, and the results have been devastating to patent holders. Large numbers of seemingly valuable patents have been invalidated and patent holders have faced huge costs and losses as opponents can launch repetitive assaults that need to be defended at great cost. For many of us in the innovation and IP communities, the term “patent death squad” sadly seems appropriate. But who are these “judges” that are causing such havoc? Gene Quinn of IPWatchdog.com has done some great investigative journalism and revealed that these judges are a far cry from what one would expect in terms of their legal experience. Many have just a few years of experience, which helps explain some of the surprising decisions they have rendered. See “PTAB Judges Shockingly Inexperienced Compared to District Court Judges” by Gene Quinn at IP Watchdog, March 6, 2018. A short excerpt follows, but see the original article for key data and some incisive comments afterwards. What was most astonishing is just how inexperienced many patent judges of the PTAB are compared to federal district court judges. For example, many PTAB judges were appointed to the PTAB at a time when they were associates, and in some cases junior associates. This study uncovered several shocking revelations. First, 12.64% of PTAB judges were appointed with less than 5 years of experience prior to their appointment as APJs (i.e., 5 years or less removed from graduating from law school), while some PTAB judges were appointed with as little as 2 years of experience. Indeed, 7.47% of APJs had 4 or less years of experience when they were appointed to the PTAB. More than one-third (36.21%) of PTAB judges were appointed with 9 years or less of experience…. The America Invents Act (AIA) invests PTAB judges with extraordinary powers. For example, overwhelmingly institution decisions are not appealable. Yet, there have been numerous lawyers with shockingly little experience appointed to the position of patent judge, and vested with the power to make decisions that cannot be reviewed by any Article III federal court. The Summer 2010 issue of American Educator (a publication of the American Federation of Teachers) ably illustrates one of the lessons we teach in Conquering Innovation Fatigue: metrics to drive performance can have unintended consequences that may actually hurt rather than help. Indeed, unintended consequences are a major theme of our book, as we explore the problems arising from metrics, corporate and government policies, corporate innovation initiatives, laws, taxation policies, and other factors, all of which can contribute to innovation fatigue. In terms of education and the danger of improper metrics, Linda Perlstein’s article, “Unintended Consequences; High Stakes Can Result in Low Standards,” examines a highly celebrated school in Annapolis, Maryland that received media attention and praise for seemingly miraculous success in education. The new principal arrived in 2000 to find Tyler Heights Elementary School in a dismal state with only 17% of its students getting satisfactory scores on the state test. She began redirecting efforts in the school to address this problem. Eventually her laser-focus efforts paid off, delivering the stunning success of 90% of third-graders performing well on the Maryland State Assessment, when only 35% of third-graders did so two years before. Several newspapers recognized the amazing turn-around and people at the school celebrated the success. But was it real success? To achieve good performance on the Maryland State Assessment, education for the children was largely focused on how to do well on the test. Students learned how to write BCR’s (“Brief Constructed Response”) to deal with expected questions about poems and plays, and practiced writing these short answers for many hours, without actually studying poems or plays. “What gets tested is what gets taught,” the principal told the teachers, even if that meant leaving behind the material that was supposed to be taught according to state standards. Bins of equipment for studying science were largely unused. The state standards required a broad curriculum, but the metrics for assessing that were based on one particular test and all the incentives were for helping students pass that test. In spite of the praise for the miracle at Tyler Heights, had the children really been helped? Campbell’s Law is at work when schools game tests to get better scores, at the expense of education. It is at work when cardiologists choose not to operate on patients who might need surgery rather than risk hurting their own published statistics on mortality rates among their patients (Koretz refers to a 2005 story from the New York Times reporting the shocking results of a survey of cardiologists). It is at work when a company tries to boost innovation with metrics or incentives that result in game playing, while leaving the real problems from culture, systems, and vision unaddressed. In our experience, metrics and incentives can play a valuable role in driving innovation, but only when the corporation has a culture that genuinely encourages innovation, when there is a shared vision of innovation and success, and when sound systems are in place to advance innovation. Without those, you can not only waste a lot of resources in attempting to drive innovation with metrics and incentives, you can actually make a weak culture become pathological and lethal, sometimes exacerbating fatigue factors like the Not Invented Here syndrome, theft of credit for innovation, and breaking the will to share. Adding incentives linked to metrics without the right culture and systems can be sort of like throwing raw meat into a school of sharks or piranhas. You can generate a lot of activity, a lot of exciting thrashing and splashing, but in the end there will just be a lot of blood in the water and fewer thinkers and producers in your school. As always, innovation success requires that you carefully monitor for harmful unintended consequences from the policies, programs, and incentives you have in place. Innovation metrics, incentives of all kinds, and employee performance evaluation systems and other tools associated with metrics can backfire. Unless you are tuned to the voice of the innovator and understand the impact of unintended consequences, you can be like the company we treat in Chapter 8 of our book that felt like it was a rock star of innovation while they were actually squelching it. Don’t let the unintended consequences of well-intended policies and metrics crush your innovation success. One of the lessons of Conquering Innovation Fatigue is that the choice of metrics business leaders use to track and drive innovation can contribute to innovation fatigue when the metrics drive bad decisions and poor behavior. A recent example of how metrics can actually achieve the opposite of the intended results comes from a Wisconsin grocery chain, where a friend employed there explained the unintended consequences of management’s good intentions. Management is now pushing for higher levels of IPM, items per minute, as a metric for the performance of cashiers. This is a measure of how many items per minute the cashier processes, and sounds like a valuable metric for productivity. Faster checkout means happier customers and shorter lines–of course we want IPM to be high. However, as with all metrics, the details of how IPM is calculated come into play and may bring unintended consequences. For IPM, the clock doesn’t tick when a lane is closed or, more specifically, when the cashier’s terminal is in “secure” mode. Shut down the terminal to the “terminal secure” state and the clock stops, something that some cashiers use to their advantage while checking out a customer. A new manager at one store is pushing for IPM scores of at least 30 for all cashiers, but as one cashier explained, the only way that you can achieve that high of a score is to routinely go to “terminal secure.” If the cashier has to help with the bagging or do other tasks that reduce IPM, they can secure the terminal and then reactivate it before they continue scanning goods. That gives a higher IPM score, but the back and forth of securing and reactivating the terminals actually SLOWS DOWN the real work because it involves extra steps that eat up valuable time. By focusing on IPM as a proxy for productivity, productivity can actually decline. A further consequence of securing a terminal is that the customer may need to swipe his or her credit card a second time. The card readers in each checkout lane allow customers to swipe their credit card during the scanning of goods, but when the cashier switches to terminal secure mode, the swiped credit card information is discarded and the customer will have the annoyance of having to swipe a second time. By focusing on IPM as a proxy for customer satisfaction, the annoyances to the customer and the time to check out actually increase. Unintended consequences of metrics can easily follow similar patterns when it comes to innovation, intellectual assets, and new product development. Leaders need to step back and observe the impact of their metrics on those in the ranks and on the actual performance of the company. A carefully selected basket of metrics with frequent reality checks are needed to avoid hindering real productivity and innovation with your good intentions. Innovation has often been killed by poor metrics, part of the innovation fatigue factor of flaws in judgment and vision. Poor metrics can include financial analysis that emphasizes short-term gains but overlooks the future. 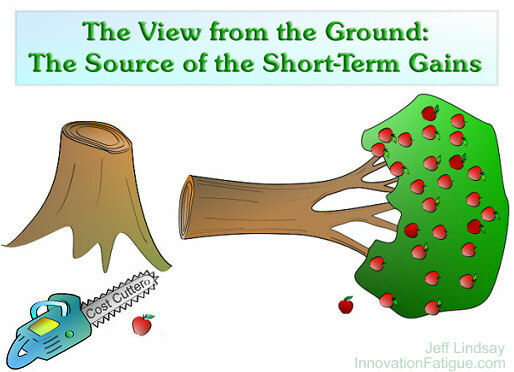 One way of illustrating the problem is with the “Apple Tree Analogy.” Imagine a fruit production company that is concerned with the rising costs of apple production and the poor efficiency of manpower at harvest time. A hot-shot expert steps in to shake things up and turn things around. Suddenly, executives in their distant offices see reports showing dramatic gains in the efficiency of harvesting (perhaps a measure of the time required to pick the fruit from a tree) and a sharp drop in harvesting costs such as expenses for ladders and labor. Wonderful news! Harvest Efficiency: Sudden Huge Gains! Harvest Costs Show Dramatic Drop! But what is the cause of the gains? If management is remote and not in tune with what is happening on the ground, they might rely on the metrics or key performance indicators to conclude that the business is healthier than ever and issue huge bonuses to the geniuses who transformed the apple business. In reality, the short-term gains might have come at a surprisingly high cost, namely, the future of the business, as shown below. 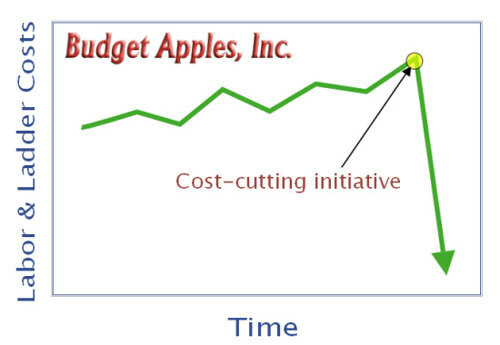 Sometimes dramatic cost-cutting efforts can lead to great short-term metrics and make a business seem healthy, when in fact, it is doomed by the very actions that gave it the short-term boost. Cutting down every apple tree in the orchard will greatly simplifying harvesting. No need for ladders at all! But the crops of the future have been wiped out. Innovators in your company are the source of your future crops. Cutting innovation staff will always look attractive for the short-term, but can your future afford it? Make sure you are using wise metrics in making decisions about innovation, research, and new product development. It’s a topic we address in Conquering Innovation Fatigue, and one of the important reasons why you and your team need to be familiar with this book.